Paul Tonkinson - I want a comedy night! Paul Tonkinson A sensational live performer, Yorkshire man, marathon runner and former (double award-winning) Time Out Comedian of the Year, Paul Tonkinson has long upheld his esteemed reputation as one of the finest stand-ups the UK has to offer. With a unique and distinctive style, Tonkinson is noted for his effervescent physicality and skillful impressions, which bring alive exuberant, tender comic reflections on love, family and the day-to-day idiosyncrasies of 21st century living. A plethora of first class material, combined with tremendous charm and irrepressible, infectious energy make for quite a formidable talent. A shameless and a self-confessed professional northerner he is also a fanatical Manchester United supporter and regular appears as one of the talking heads on numerous football chat and tribute shows. That head also gets a fair bit of exposure on those other never-ending I Love …., the Greatest Ever … and Do You Remember … shows so beloved of modern TV programmers. The complete Paul Tonkinson is a star in his own right and a true master of comedy in all its different guises – on stage, in character, on screen, on air, compere or host. Whatever he chooses to do or be at any given time, Paul Tonkinson never fails to make his audience roar with laughter. But it is stage as a stand-up comedian that he is most at home. 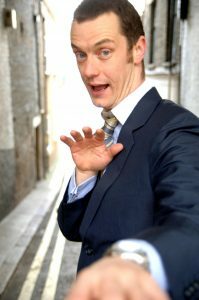 A master of mimicry and particular amusing accents, he takes his audience on a guided tour of Britain, using his observational skills – and those funny voices to find humour in almost every region in the UK and further afield. He also shares the mind-boggling image of losing his virginity to his friend’s sofa – and subsequently getting banned from his house – and offers some amusing ideas on the differences between male and female logic and behaviour. Sadly he has been known to spoil it all by talking about football and Manchester “****ing” United.